Luxury Villa with Spacious 4½ BR, 4 BA, Fully Equipped Furniture, Kitchen. Balam Ek: is an ocean-front, private home located ½ Mile from central Akumal. This beautiful house is designed taking advantage of the Caribbean breeze and the view to the ocean from every room in the house. There are simple and elegant Mexican decorations in every detail of this villa. The patio leads out to the Ocean and snorkeling access into Half Moon Bay. The beautiful small round pool is seating in a large wooden deck where the panoramic view invites you to relaxation with the drink of your predilection in reclining chairs. In the upper floor is the master bedroom with a king size bed, a large dresser closet and a full bathroom. There is a balcony in the master bedroom with panoramic view of the Caribbean. There is also a small bedroom with a single bed and private balcony next to the Master bedroom. The second bedroom upstairs have two queen size beds and one single bed, also this bedroom has full bathroom and a large window with spectacular ocean view. Down stairs is the third bedroom with a king size bed, it has a large sliding glass door that leads out to a private terrace surrounded by plants and the beautiful ocean view. All the bedrooms in the main house, has ceiling fans and air conditioning. The living room down stairs has spacious area, very comfortable and relaxing, with concrete embedded furniture, details in wood and colorful Mexican style cushions; There is a flat screen TV/DVD and satelite, videos, also a radio-stereo and CD player. The dining room has a big wooden table with ten chairs which are upholstered in a colorful fabric. Kitchen is decorated with a Mexican style beige, blue and green colored Talavera tiles. It's fully equipped including, refrigerator, stove with oven, microwave, toaster, blender, coffeemaker, in the Pantry, you can find all the utensils, pots, pans, dishes, glasses, casserole dishes, baskets for bread and tortillas, purified bottle of water, cooler, candles, lighter, etc. In the large terrace in front of the ocean, you can find a Grill. If you wish you can have your own meal prepared at home. (Cook is extra, the maid is also a great cook). The house also have an attached two story studio with delicate decoration, upstairs is the bedroom with a king size bed, closet, full bathroom with a Jacuzzi, and large balcony with hammocks and chairs to enjoy the great view of the coconut trees and the turquoise water of the Caribbean sea. Downstairs is the living and dining area with complete kitchen, stove, refrigerator, all the utensils. There is also a terrace with chairs and reclining chairs. This is perfect for a couple. Your vacation villa in Paradise. Amenities: Air conditioning in bedrooms (main house), Ceiling fan in all bedrooms and living area, CD Player, TV/DVD and satellite, Books, Pool, Ocean view, Charcoal Grill, bottles of drinking water, cleaning service (six days a week), Fully Equipped kitchen, All linens, Bath towels and beach towels furnished, Security box for your valuables. Akumal is a small beautiful town that has a lot to offer. Tranquility, fun and relax. Also Akumal is a diving destination for many people around the world. For the non divers, the areas cenotes, bays and lagoons all make the perfect place for an introduction to snorkeling. Kitchen utensils, cooking condiments, oil, paper towel, foil, napkins. Walking distance tennis course available for extra cost. Smoking allow outside of the villa. Wheelchairs: Ramps are provided for easy access on the ground floor. 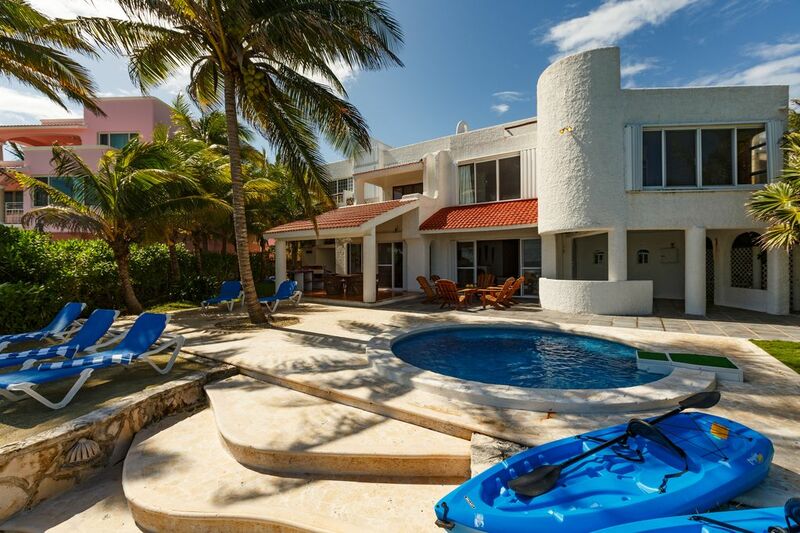 Villa Balam Ek is located 68 miles south of Cancun international airport. 18 miles from Tulum archaeological sites and 23 miles to Xcaret Eco park. Right in front of the Caribbean sea. Other Activities: Snorkeling, Kayaking, sailing, diving, swimming. Golf: Akumal Bay: You will be amazed at the diversity of life you will see in these calm shallow waters and also you can see plenty of turtles eating the grass that grows in the bay…you can not lose it!!! Akumal bay is one of the most beautiful sandy beaches in the area, it has plenty of palapas and palm trees that will provided you a nice shade while you enjoy the great view of the Mexican Caribbean. The reef is very close to the shore, so you can snorkeling in a very beautiful places and you do not need a boat, just your fins will take to a great places. And if you are a person who loves water sports you can practice diving, kayak and sport fishing. Akumal bay has one restaurant bar right on the beach where you can enjoy a great snacks or a margarita while you rest on the beach, also at this restaurant you can find showers and bathrooms. Yalku Lagoon: Visit this beautiful and great place for swimming and snorkeling. Yal ku lagoon is in North Akumal, 2 Km from Akumal main bay. Ski: Yalku Lagoon: You can walk or bike from the main entrance or rent a golf cart. Taxis are available 24 hours. Bring your mask and fins, but leave the sun screen behind, as it pollutes de lagoon. Is Open from 8:AM to 5PM all week. Cost $10 per person. Because Akumal is a small place, renting a bike is a good idea and is a great relief from long walks in the heat and definitely good fun. Bicycles are available for rent in Akumal. The Caribbean Sea is an obvious attraction for those seeking the warm, invigorating water and relaxation under the sun. There is more to see and do, this area open the door to new adventures in to the jungle where you learn more about our marvelouw flora and fauna. The wonders of the wilderness unfold while taking a a walk.